A unique personalized family ornament that is certain to be the talk of the party, this adorable piece is a must have this Christmas. It’s sure to be a jolly Christmas when you add this personalized family ornament to your holiday décor. Featuring a whimsical design, two parent reindeer and up to five child reindeer, this piece will add a fun-loving touch to your festive celebrations this year, and for years to come. Sure to be the talk of the party, it’s certain to bring a smile to friends and family members. This unique personalized ornament is made from high quality resin and measures approximately 3.5 inches x 4 inches to fit perfectly on your Christmas tree or ornament display. Each creation is individually hand painted for a one of a kind touch, and your personalized decoration can include up to eight characters per name and can even feature your family name in the snow. Order yours today and spread the joy. 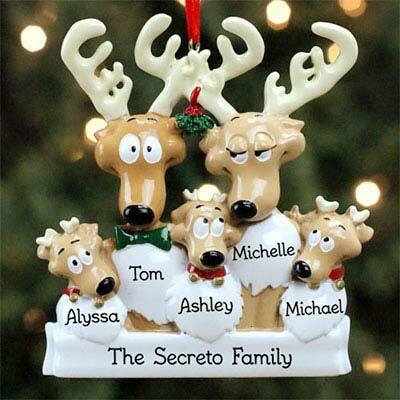 I love the Personalized Reindeer Family Ornament, Perfect for Christmas!